The Surma, a tribe of cattle farmers and warriors, live in the remote Omo valley in the south of Ethiopia. They possess real artistry when it comes to painting their own naked bodies and talk with pride about their lives, which to a large extent are rooted in tradition, although a lot of changes are also taking place. 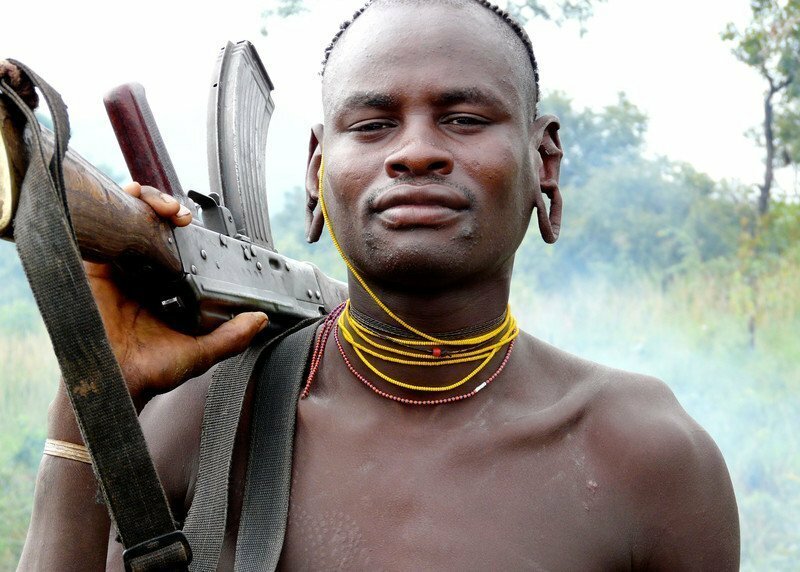 The call of war can be heard from over the mountains in South Sudan, and the instruments of this war often find their way onto the Surma’s land: the price for the prettiest girl is currently 35 cows and a Kalashnikov. In Brazzaville, the capital of the Republic of the Congo, there is a group of men who escape poverty in a remarkable way: by dressing in colorful suits with matching accessories. They are sapeurs, and are drawn from many different backgrounds, but all of them are determined to retain their dignity through their appearance and lifestyle. Meanwhile, on the opposite bank of the Congo River in Kinshasa, wrestlers – including an albino named Texas and a young woman who goes by Zena – are preparing for a contest. They too are upholding a lifestyle in which tradition, religion and modern African society intertwine. In beautiful images accompanied by remarkable texts, music and expressive editing, this triptych paints a loving, attentive portrait of African pride. (1955-2013) German film director. He raised in Djidda, Khartum, and Singapore. He started his film career at the University of Television and Film in Munich in 1977, where he met fellow student Roland Emmerich with whom he enlisted in the Directing program and shortly afterwards co-directed their first student film. Thirty years of collaboration and friendship continued in which Richthofen pursued a successful career in advertising and music videos. He headed up one of Europe’s leading production companies. In 2004 he teamed up again with Emmerich and co-produced 10,000 B.C. and Trade. Having traveled and worked together in Africa over the years, Richthofen and Emmerich became avid collectors and keen appreciators of African art. With the trilogy 35 Cows and a Kalashnikov, which had its world premiere at DOK.fest Munich, Richthofen and Emmerich strove to pay artistic tribute to a very special continent.